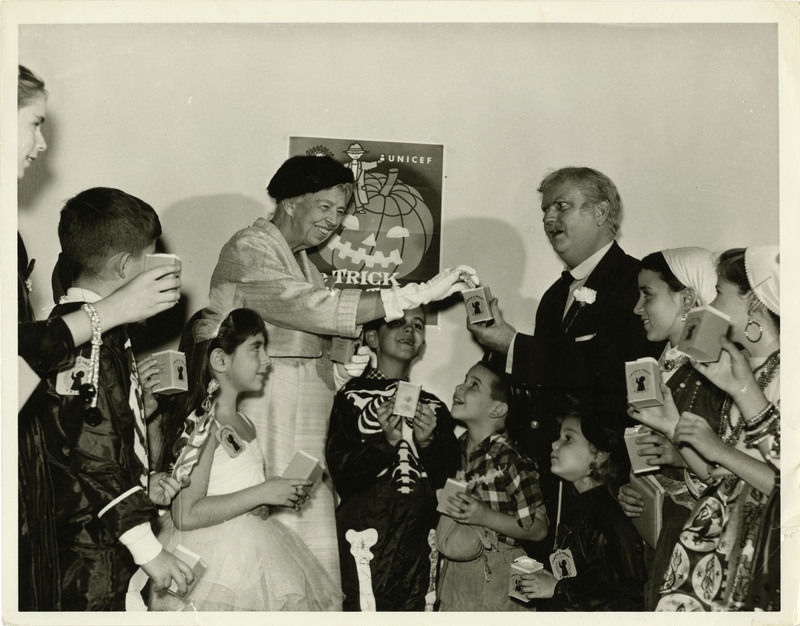 Eleanor Roosevelt launches UNICEF Halloween “Trick or Treat” program at the United Nations with Captain Kangaroo. I went to the United Nations the other afternoon to be photographed with some of the children who are taking part in the Halloween Trick or Treat program for the benefit for UNICEF. UNICEF stands for the U.N. International Children’s Fund. The “E” used to be for “emergency,” but while it is still left in the alphabetical name, the program is no longer an emergency program. It goes on every day, all year around, feeding children who are hungry, wherever it is possible to do so throughout the world, helping people to feed their children better with local foods, and in cooperation with the World Health Organization putting on campaigns against diseases which attack children. It has become a real community undertaking, and instead of people being afraid of tricks that might be played upon them and real vandalism, which often did occur in days gone by, we now know that with the pennies we have saved to give, something can be done for children in the world. And often added to the pennies are cookies and candies for the children who thoughtfully go about collecting for youngsters in other parts of the world. The FDR Library is open! Congress has restored funding of appropriated activities and the Franklin D. Roosevelt Presidential Library & Museum is open for both museum visitors and researchers. Due to the Federal Government shutdown, the FDR Library is closed. We are unable to post or participate in any of our social media channels during this closure. All National Archives facilities are closed, with the exception of the Federal Records Centers and the Federal Register until the Federal government reopens.